He is past exhibitions and publicity chair for the Guild of Book Workers. His bindings have been exhibited widely with the Guild, and in invitational and solo exhibitions throughout the USA and abroad. In 1994 he founded Book_Arts-L and the Book Arts Web, also publishing The Bonefolder: e-journal for the bookbinder and book artist. He was awarded the Guild’s Laura Young Award for service to the organization in 2009, and their Lifetime Achievement Award in 2016. For a complete record of his professional activities please view his Curriculum Vitae online. 1981-1985 BA, The Johns Hopkins University, German literature. For a full listing, see his vita here. 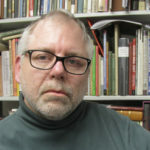 His most active research interests include the study of bookbinding techniques, in particular the German style about which he has most published in various journals. He is the translator into English of Ernst Collin’s Der Pressbengel, with a 2nd edition (fine press and print-on-demand) out starting in 2016. That text can also be downloaded to print and bind in any setting. He is also the author of a history and bibliography of The Collins: W. Collin, Court Bookbinders & Ernst Collin, the Author of the Pressbengel that also appears in German as Die Collins: W. Collin, Hofbuchbinder & Ernst Collin, der Autor des Pressbengels. These activities are also shared via his Pressbengel Project blog. In the same vein, he introduces students studying the book as art to the fundamentals of sound structure and its continuing validity to the art of the book. He is also interested in the impact of the online environment on the book arts, especially in regard to how people learn.